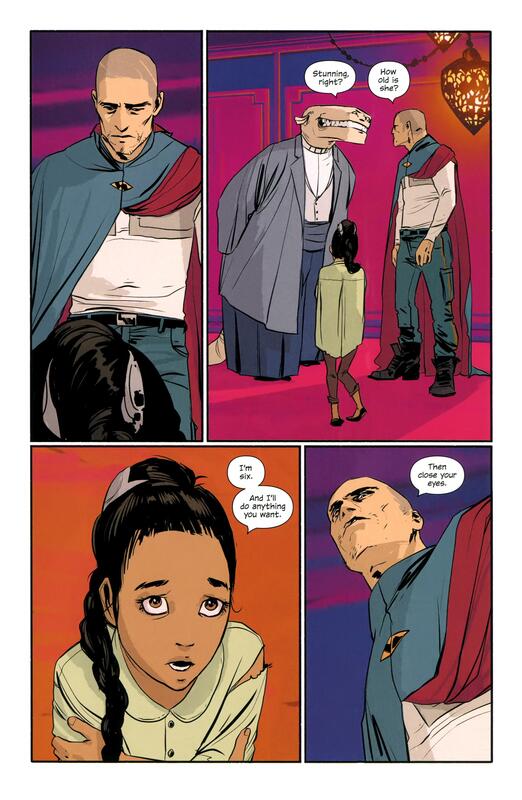 A compelling and empathetic tale of two people from different cultures trying to make it work, Saga Volume 1 by Brian K. Vaughan and Fiona Staples render a “human” tale. 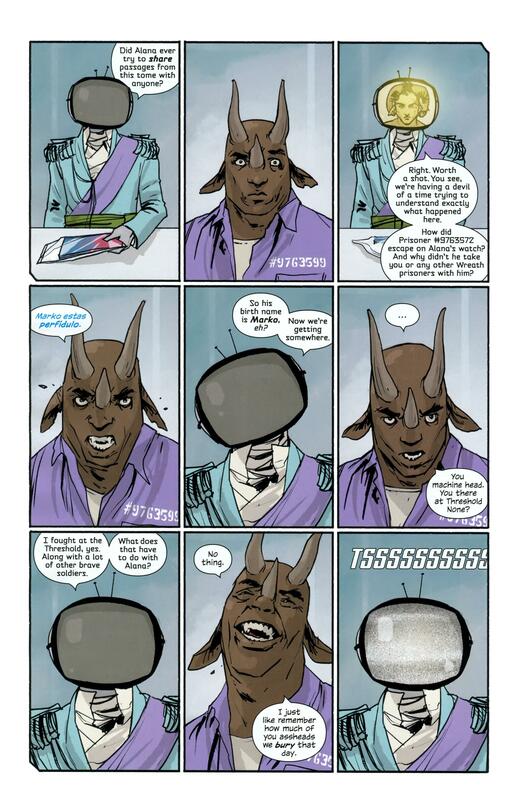 Brian K. Vaughan has managed to write a space comic about people: focusing on the characters and how they interact and deal with the events life throws at them. They deal with events most of us encounter, with the added dimension of alien races, war and magic thrown in to make it entertaining enough for us to suspend our own lives and establish a connection with these characters. It’s very well done. Against a backdrop of war, Alana and Marko are from different worlds but fall in love and have a baby, willing to give up everything to be together and be a family. Shunned by both societies, they’re trying to get to a safe place. Marko is striving to be a pacifist but that doesn’t always work when faced with protecting what’s yours. Alana is learning to what extent you would go to protect your child. This story would work in any setting but Vaughan gives us those oh so entertaining elements of a magic, fantasy and science fiction. 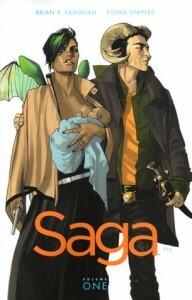 Just like life Saga is funny, tragic, dramatic, emotional: an experience. 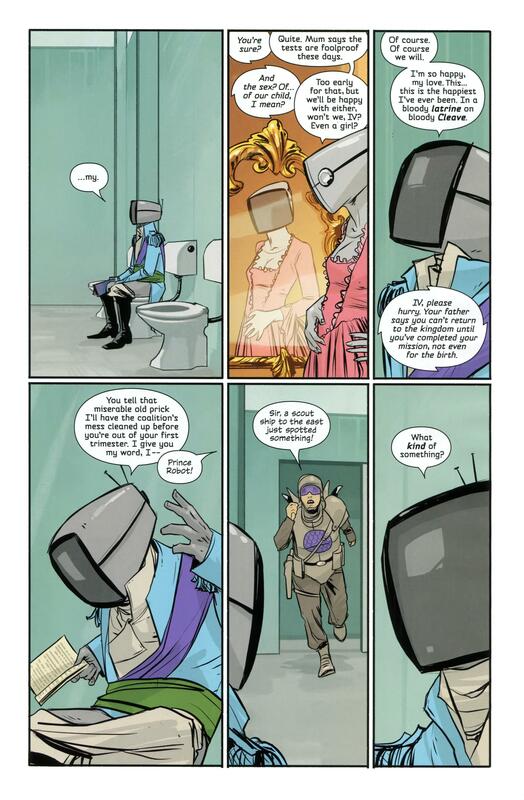 To balance out our love lost protagonists we also have The Will, a bounty hunter with a moral code and Prince Robot IV, a royal from a race that has 1950s television sets for heads. And Izabel, a child spirit, plus a host of other foils to illuminate Marko and Alana. No shortcuts here: as the tale progresses characters are fleshed out and the stage is set for everyone to come together, just not in this volume. 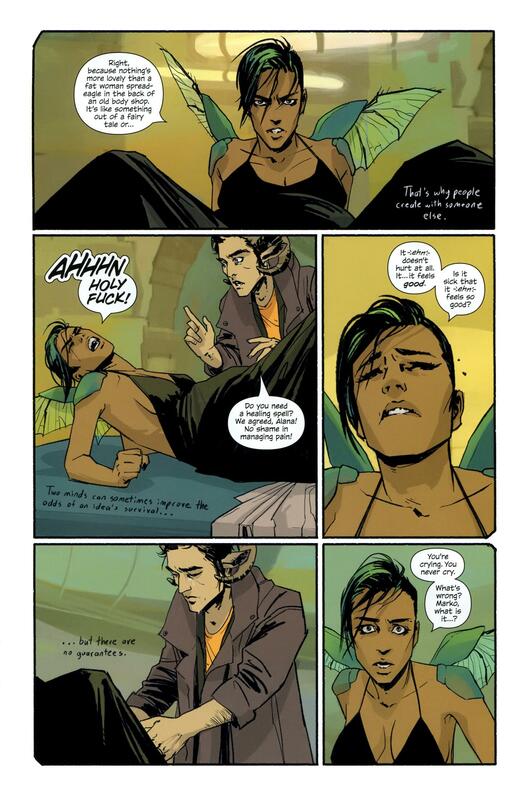 The art is clean, detailed and an opportunity for Fiona Staples to really shine. She’s handling all the art chores: pencils, inks and colours. As is her style the colour palette is muted, flat perhaps, but completely compelling. Staples has made a career of great designs and fantastical characters which really shines in Saga. This story is filled with a wide range of emotions and it’s expertly conveyed in the character’s facial expressions and body language. Saga Volume 1 is a steal at $9.99 USD: Image has a good sense of trade paperback pricing but they’ve pulled out all the stops at that level. No extras, but this is 160 pages of entertainment. Don’t miss out.